Revenue in the Soft Drinks segment amounts to US$89,783m in 2019. The market is expected to grow annually by 2.1% (CAGR 2019-2023). In global comparison, most revenue is generated in United States (US$102,433m in 2019). In relation to total population figures, per person revenues of US$118.70 are generated in 2019. The average per capita consumption stands at 87.6 L in 2019. The market segment Soft Drinks covers all types of water-based Non-Alcoholic Drinks with added sugar. This includes Carbonated Soft Drinks like cola, lemonade and energy and sports drinks on the one hand, and Non-Carbonated Soft Drinks like fruit nectars, fruit juice drinks, flavored water and ready-to-drink (RTD) tea and coffee on the other. While Carbonated Soft Drinks have been on the wane for quite some time now as health-oriented consumers shift to low-sugar diets, smaller segments of Non-Carbonated Drinks like RTD tea and coffee especially have taken up some of this slack. The most important producers in the Soft Drinks category are the Coca-Cola Corporation, PepsiCo and Red Bull. The market for Non-Alcoholic Drinks is structured into off-trade sales (in stores) and on-trade sales (in bars, restaurants etc.). Statista values off-trade sales at retail prices and on-trade sales at wholesale value. Additional markups for hospitality services are therefore not taken into account. Reading Support Revenue in the Soft Drinks segment amounts to US$89,783m in 2019. Reading Support The Soft Drinks segment is expected to show a revenue growth of 2.0% in 2020. Reading Support The average revenue per person in the market for Soft Drinks amounts to US$118.70 in 2019. Reading Support In the market for Soft Drinks, volume is expected to amount to 68,424.7 ML by 2023. 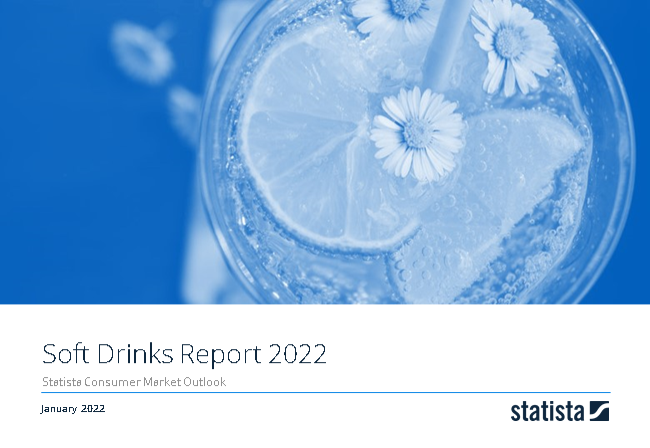 Reading Support The market for Soft Drinks is expected to show a volume growth of 0.9% in 2020. Reading Support The average volume per person in the market for Soft Drinks amounts to 87.6 L in 2019. Reading Support The average price per unit in the market for Soft Drinks amounts to US$1.35 in 2019. Reading Support With a market volume of US$102,433m in 2019, most revenue is generated in United States. Here you can find more studies and statistics about "Soft Drinks".